Team member: "We are living in this grey zone ... it is not legal"
SHANGHAI, China (CNN) -- On Saturday at 10 a.m. it's show time for Brenda Zhang and her subtitle team. They roll out of bed, meet each other online and chat, while their modems download the latest episode of "Prison Break," which just aired half a world away on Friday night in America. "This is a way to fulfill your life and do something you are interested in," said Zhang, a 24-year-old who translates for a team that calls themselves "Showfa." "I think Chinese people need to know something different, to see how the foreigners think about life, think about love." Translation team members download TV shows through different methods: watching directly from a Web site or downloading from a translation group Web site. Clips can also be downloaded through BitTorrent -- file-sharing sites such as Xunlei. Through this method, groups post their "seeds" on these sites, and people can download them. "We are living in this grey zone," said Deping Wang, a former member of a team called 1000fr. "It is not legal, but at the same time, nobody can live without it. This is the dilemma." Many international media companies are concerned the groups are eroding their potential profit margins in China by illegally making the content available for free. Some, however, see the translation groups' efforts as a conduit for cultivating a market that will be willing to buy content if it is allowed to be distributed through official avenues in the future. "While there is still an issue on the translation right, we also take a broader view to look at its impacts on other parties such as it's providing a platform for a Chinese audience who would otherwise not be able to understand or access The Economist content," Henry Luk, Asia-Pacific regional director for The Economist Group, told CNN via e-mail. "We want this magazine to be published in Chinese," said translator Jerry Bai at a recent party held by some of the Eco Team members in Shanghai. "This is our only one wish." "These are fascinating communities," Meng said. "You think that everything online is more egalitarian and anti-establishment, but what we see is the emergence of another kind of operation of power, but maybe the power doesn't come from the traditional source but from different venues." Within each team, there are leaders responsible for organizing the translation efforts of various sub-groups assigned to different TV shows and movies in English and also other languages such as German and Japanese. Leaders select the shows to subtitle by taking votes from Chinese "netizens" about the programs they want to see. More experienced translators are given so-called "zero day" shows -- highly popular programs, like "Prison Break," that are recorded and uploaded by someone living abroad to a special FTP site immediately after the program. 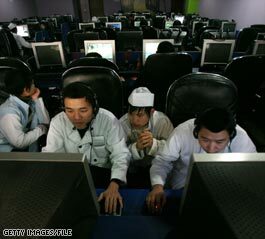 Meanwhile, back in China, a team is on standby, ready to download and subtitle the show as fast as they can for Chinese fans to watch online -- and to see if they can beat rival translation gangs. "It can buy 10 minutes, and, you know, 10 minutes means a lot of things," said Wang, the former member of 1000fr, one of the first translation teams in China. There are around a half-dozen other subtitle groups that are well known, including YDY, or Yidianyuan (Garden of Eden), 1000fr's main rival. "These two groups fight together to see who is the fastest to translate into Chinese," Wang said. "Two hours was one of our record translation times." "A lot of people apply. A lot," said Zhang, who is responsible for bringing in new recruits for Showfa's Japanese subgroup. "There are a lot of TV series, and we need a lot of human resources." Zhang finished school several years ago but still manages to find time to spend with her subtitle group who she says are also her best friends. They also meet online every Tuesday morning to translate another popular American show, "24". Yet now on Saturdays, Zhang and the translators will have to come up with a different routine. This season of Prison Break was its last. "We will take a break," Zhang said. "And wait for new shows."